“The first decades of AXA Millésimes’ ownership were all about the vineyards.” So speaks Christian Seely (right) as we clamber dustily down the scree of the Noval slopes. This Quinta, perched high on the banks of the Douro, is one of Port’s great names, and is also Seely’s spiritual home. The charming, Harrow and Cambridge-educated Seely may be minus the trademark bow-tie today, but in cream-coloured suit and fedora he cuts a somewhat unlikely swathe as we slither and slide down yet another steep bank, where even tractors fear to tread. Seely is one of the most important figures in European wine making, as Managing Director of AXA Millésimes, the wine estate branch of the financial and insurance giant AXA. Owners not only of Noval, but of Pichon-Baron in Bordeaux, Disznoko in Tokaji and Château Suduiraut in Sauternes amongst others, Seely has been with AXA almost since their move into wine began. The illustrious house of Noval was slightly treading water in 1993 when AXA stepped in to purchase it. At the time Seely was gainfully employed as a business trouble-shooter for a venture capital firm in Birmingham but, as he says, “looking to get out.” When he read that AXA had purchased one of the most prestigious vineyard properties in Portugal he cold-called them, writing immediately to suggest he was the man for the job of overseeing the new venture. “I started with them on October 14th 1993 and was thrown straight in at the deep end,” he explains, including having to present a full report to the Paris board by mid-December on Noval’s condition, investment strategy and potential. All of that worked out, and soon after Seely uprooted family and settled at Quinta do Noval, to begin charting its course back to the top echelons of Port wine. After many happy years at Noval, Seely was promoted to MD of the entire AXA Millésime operation, necessitating a relocation to France. 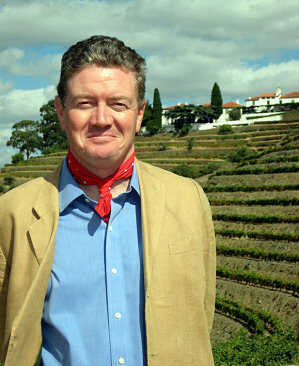 For a man with such enormous responsibility – for a whole clutch of legendary wine estates – he seems remarkably relaxed. “In many ways I can be,” he tells me. “For AXA these are as much property investments as profit-making businesses.” He explains that AXA’s very shrewd philosophy was to purchase great wine names with famed vineyards, which were under-performing and thus undervalued. They invest to rehabilitate and restore the estates, hopefully seeing the wines regain their lustre, increased demand and generating strong profits. But there’s always the fall-back position that these great vineyard estates will increase their intrinsic market value too. Back to the sweltering slopes of Noval, and Seely explains that of Noval’s 140 hectares, over 115 hectares have been replanted and terraces restructured since he took over in 1993. Syrah and Cabernet were planted in 2000 for a table wine project. These are some of the most immaculately tended vineyards and terraces I have seen in the Douro, the effort and attention to detail that has gone into them over the 17 years of Christian Seely’s management is obvious. Speaking of their recently launched Noval ‘Black’ Port, he says “The Black Port is really a result of all the work we’ve been doing in the vineyard over the past 17 years. We have a lot of very good fruit to work with now, and even though it might not be right for our vintage Port, I just felt we needed to make a modern, premium product with it.” The project has worked, The Black Port, released in 2009 in the US, sold 8,000 cases in its first year and was released in the UK in 2010. Above: freshly harvested Touriga Nacional about to be transported to the winery. For the Port wines, winemaking is very traditional, with foot treading in ancient stone lagars, though these have been supplemented by additional automated versions at the Noval facility not far from the Quinta. 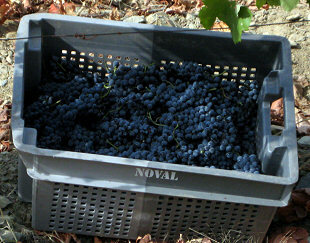 Undoubtedly Noval’s most famous Port wine is the Naçional, made from a tiny plot of little more than two hectares of old, ungrafted vines that sits immediately in front of the Quinta. The name Naçional reflects that these are Portuguese vines planted in Portuguese soils and not grafted onto American rootstocks as is common throughout Europe to overcome the scourge of the Phyloxerra bug. Yields from these gnarled old vines are tiny, and production is just a couple of hundred cases annually, but these are the most sought-after Ports in the world – with correspondingly high prices. The legendary Naçional is made only a few times per decade, in special years. Interestingly, the declaration of ‘Naçional years’ does not always follow the same pattern as declaration of the regular Vintage Port. 2000 and 2003 where ‘classic’ years when both were declared, but Seely made Naçional in 2001 for example, otherwise not a vintage year. The table wines of Quinta do Noval are covered in part II of this feature, along with the Ports and table wines of Seely’s other Douro estate, Quinta da Romaneira. Nice chocolaty nose and quite fresh and clean, with a touch of herbal character and lots of fruit. The palate is smooth and rich, the spirit nicely tempered and the wine balanced. A very good example though Christian is phasing this wine out over the coming years, as he does not want to be in the ruby category. 87/100. See all stockists on wine-searcher. Launched in UK in 2010. Darker, more serious nose, with a certain density and a strapping feeling that it will be muscular and bold. Glimpses of something floral. Indeed on the palate it has a great fleshy density, with prune and stewed black fruits and an intensity with chewy tannins into the finish. 89/100. See all stockists on wine-searcher. Used to be made with some bought in grapes, but since 2004 they make less but only from estate fruit, trodden in lagars and treated with great respect. It is a single quinta wine, so Christian says “we are not in the ‘LBV wars’ trying to flog it at cut price for Christmas and so on.” Lovely ashy minerality and hint of tarry, Douro bake quality. A little lift to the fruit, lots of chocolaty dark berries coming through. The palate has delicious raspberry brightness to it, a real line and definition, with a more chocolaty density of tannins filling in but it has life and immense drinkability. 91/100. See all stockists on wine-searcher. The thing that marks out Noval’s tawnies is their freshness, even in the 40-year-old, which is perfectly balanced and highly drinkable. Nutty, with a little shellac note, but still fruity and showing some primary character, raisins and chocolate but also a bit of cherry and berry fruit. The palate is warming and creamy-textured, with delicious sweetness and the walnutty dryness of the finish offset by more of that fresh fruit character. A delicious 10-year-old. 91/100. See all stockists on wine-searcher. More intense, with intriguing notes of orange peel and fine herbs amongst the nutty notes and glace and dried fruits. The palate has lovely intensity too, but the wine is not dense: it retains a lot of lightness and crispness, the citrusy acidity and leaf tea delicacy coming through and the finish going on forever. 93-94/100. See all stockists on wine-searcher. Powerful, vinous wine, with dark, complex polished wood notes and a real intensity. This has great sweetness and huge depth on the palate, though it lacks the balletic poise of the 20-year-old. A beautiful old wine but if anything a touch too intense, the fruitcakey richness delicious but searingly dark and concentrated. 92/100. See all stockists on wine-searcher. Christian’s first Colheita. Lovely creamy cappuccino and walnutty character is fine with a figgy richness of fruit. The palate has great concentration and intensity, with a cherry fruit at its core and deliciously creamy tannins. That orangy acidity really lifts this, with a bit of real edge and spark, the lip-smacking freshness cutting through the fig and walnut richness on the finish. 92/100. See all stockists on wine-searcher. Still has a lovely elegance about it this, with less intensity than the 40-year-old tawny which makes it much more charming and easy to sip, and though not hugely complicated, a wine of such lovely harmony with sweet fruit, a nutty, smoothed-out character and balancing tannins and acidity. Delicious in the final analysis. 93/100. See all stockists on wine-searcher. Nicely dark, currently black fruit, lots of depth and a touch of chocolate, but driven by the fruit on the nose. Fine palate too, the ashy dryness of the tannins at this stage counterbalanced by lovely fruit and a silkiness, with lovely sweetness. Very fine. 91-92/100. See all stockists on wine-searcher. Meaty and fleshy, with a touch of gamy character that is very attractive, and lots of sweet black fruit onto the palate. Very tight and chewy on the palate, with really big tannins drying the mouth. The balance is good, lots of chocolate, liquorice and spice, but very thick and chewy tannin. Needs time, but a pretty profound and gutsy wine. 91/100. See all stockists on wine-searcher. Very nice nose: fairly low key and discreet, but with a lovely liquorice and chocolate depth to the fruit. The palate has lots of raisins and cherry fruit, a lovely twist of grapefruity acidity, and a nice finish where the tannins and sweetness cushion the wine in combination making it very easy to drink and approachable. 91/100. See all stockists on wine-searcher. Back into a more plump, rich, generous mode with lots of fat, sweet black fruit and a certain earthy, meaty depth too. The palate has great sweetness and richness. There’s a rich figgy quality to the fruit here that is very mouth-filling and sweet, but those supple, chocolate and spicy tannins add lots of richness and structure. 93/100. See all stockists on wine-searcher. Warming and coffeeish, with a lovely depth of sweet fruit, lots of fig and black plum, a sense of chocolaty richness and great concentration on the palate. Long, intense and very stylish, with great creaminess and structure. 92/100. See all stockists on wine-searcher. Lovely dense black berry fruit nose. Thick, ripe blackcurranty fruit. Very youthful, very solid and meaty, but charming fruit. On the palate already very harmonious if big, thick and rich, with silky, velvety tannins and a lovely darkness to the fruit. Sweet and grapey, but with a long, long finish. Huge potential. 93/100. See all stockists on wine-searcher. Very intense, plum and black fig richness, a real meaty density but a lovely core of fruit. On the palate terrifically supple, the tannins meaty and chocolaty, and the mid-palate weight of fruit filling the mouth. Spice and chocolate, and that fat, sweet blue/black fruit giving huge, sumptuous depth. 95/100. See all stockists on wine-searcher. Big, dense, brooding wine, with huge concentration of black fruit and a liquoricy, nutty, figgy depth but all wrapped in a sheen of blueberry and blackcurrant fruit. The palate has huge structure. This has lovely fruit and a sweet silkiness and lovely smooth, rounded finish. 94/100. See all stockists on wine-searcher. Much more aromatic lift with violet and cherry notes and very finely tuned; suggest a certain silkiness and freshness despite this big vintage. The palate has a welterweight of fruit; a great raft of creamy, dark, espresso and bitter chocolate with sweet, thick, glossy black berries. There is huge length, structure, lovely sweetness and a tannin and acid base that suggest this will be near immortal. 95/100. See all stockists on wine-searcher. A little closed, but revealing fig and quince jam richness, and a meaty, solid underpinning with lots of depth. The palate has a thick, sweet, layered structure. Delicious and a very complete wine, with a grippy, firm structure from big tannins and keen acidity, but the wine goes on and on, the length spicy and rich, but all the time the tightly wound power and concentration of fruit driving through the core. 94/100. See all stockists on wine-searcher. The Naçional is extremely rare and very difficult to get hold of, but see wine-searcher for any current stockists of any vintages of the wine. Soaring nose, the violet and kirsch like perfume of this vintage is lovely. Very vinous too, with lovely fruit and no sense of alcohol. The palate has great sweetness: fabulous purity in this vintage, with that sweet black fruit so beautifully poised, braced by firm, dry, but supple tannins and the whole structure very elegant. This has power and finesse and is a beautifully composed wine of great style. 97/100. Just a great, limpid pool of black fruit and rich berry aromas, with an ebony-like sheen of firmness and just a lift of violet and sweet plum skins. The palate has fabulous fruit and concentration. The spirit is lending invisible support, but is swamped by the creamy tannins and the weight of supple, pure, intensely concentrated black fruit. There is a beautiful edge to this – terrifically well-defined and keen, the multiple layers of tannin and fruit and more exotic spice and incense notes supply intertwined. In the end, drinking deliciously well and sweetly, though with considerable time ahead of it: measure in decades, not years. 98/100. Still very youthful colour, with a mineral edge to much deeper, darker, chocolaty tones. This seems dense and profound, with some nuttiness and a touch of liquorice, but a really deep-set fruitiness too. On the palate it is a sumptuous Port, with a great, thick, blanket of sweet fruit that wraps around the tongue but it has a wonderfully spicy and grippy structure too with the tannins plush and ripe, but sitting foursquarely as part of the mix, and a crisp, tangy bittersweet acidity too. A layered, complex and enveloping sort of Port, and fabulous. 96/100. The colour is now a burnt toffee, quite light on the rim, and the nose is gloriously rich with Christmas cake spices and dried fruits suffused through it, and subtle, delicate hints of leaf tea and citrus peel, as well as hints of fat, sweet prunes and dates. On the palate this is immensely charming. It is clearly an old wine and some of the fruit concentration may be waning slightly, but there is such glowing, toffee and walnut warmth and a lovely keen edge of acidity, as well as a trace of creamy, silky tannin, that it makes for a glorious mouthful of Port. Perhaps at its peak and not one to put away for another 20 years, but absolutely delightful and delicate. 95/100. Lovely nose, the black fruit core and the spice and pepper lift along with a little floral touch. There’s plenty of juiciness on the palate of this, with a very firm, liquoricy, dark core that is grippy and finishes with an inky density. This needs time. 92/100. Sells for same as Quinta do Noval, so around £35.